Was the Group's fire cover provided by the 2095th EFF? And if so, what was the full or proper name of this unit? This photo seems to show a pair of crash tenders bearing the unit number. Also, I wonder whether the ex-RAF Fordson tender shown above is the same vehicle seen here, while still in it's RAF markings. I know one Fordson tender was badly damaged in the Deenethorpe Village explosion, but I have no idea whether it was salvaged/repaired/etc. I am also informed that each RAF airfield was only allocated one of these tenders, prior to any US vehicle deliveries. Sorry, I can't find the photo of that particular Fordson in the debris at the moment, but I'm sure many of you will know the photo I mean. 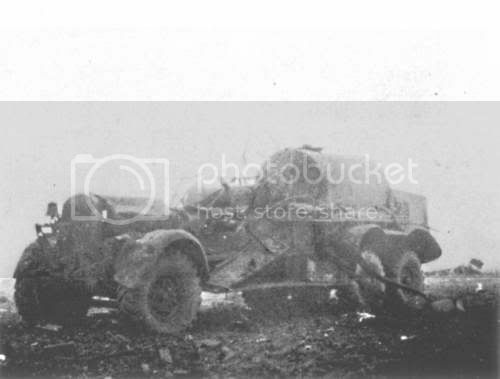 Does anyone have a copy of the photo of the damaged Fordson Tender? Otherwise I'll have to scan the picture in from the Blue Book. "Twenty minutes after the crash, the aircraft, loaded with 6000 pounds of bombs and over 2000 gallons of aviation fuel, exploded with a tremendous roar, taking the 401st fire tender up with it. The loss of the fire tender should have meant that the Group be diverted to other bases upon returning from the mission, but this also had its problems. The aircraft were still loaded with bombs and the crews on their first or second missions in most cases. After much heartsearching permission was finally given for them to land back at the base without a fire truck standing by. The touch downs were without incident and everyone breathed again." That seems to imply the tender was "lost". So, back to the photographs. Without seeing any dates which may have been applied to the original photos, there seem to be 3 options. 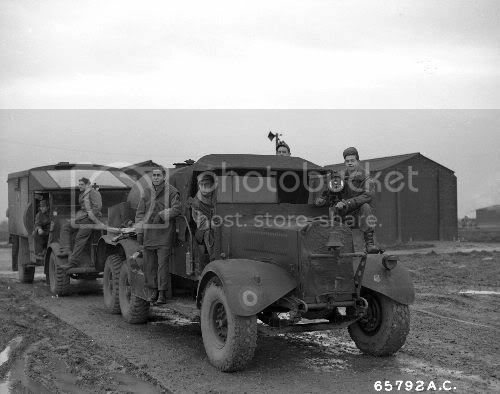 2) The photo showing the Fordson Tender with an RAF roundel is of the replacement tender, prior to it being repainted as seen in the first photo in this thread. 3) The RAF marked Tender was a temprary "loaner", later replaced by a completely new one delivered direct to the USAAF and marked up as such. Any ideas which is nearest the truth? 1. A 'clue' may be obtainable through an E-mail inquiry to the National Archives' Still Pictures Branch [contact info somewhere in the http://www.nara.gov Website]. - - Find out if there are other photos of this same subject (maybe on the 4-5 photos 'numbered' between the two in this thread) that also may be helpful. 3. The 'answer' probably won't be on these photos/captions, but 'clues' needed to get to the answer may. Well, the details are slowly emerging. 2095 EFF is the 2095th Engineer Fire Fighting Platoon. 1x Truck, Fire, Powered, Crash, High Pressure, Fog Foam, Class 135. 2 x Trailer, Fire, Crash, High Pressure, Class 1010. 1 x Trailer, Pumper, Class 1000. In addition, as can be seen on the Fire Fighting page in the Blue Book, Deenethorpe had a further vehicle, a Truck, Fire, Powered, Crash, 6x6, Low Pressure, Carbon Dioxide, Class 150. I'll get a scan of the best image, and post it up with pages from the TM illustrating the different items listed in the T/O & E.
Now here's something that's been playing on my mind, alongside the Control Tower windows alteration. I can remember this building, albeit collapsed, in the '80s, and there was certainly a doorway in both ends. In fact the easiest approach was from the end seen in the above photo. So the whole end wall must have been rebuilt to insert the doorway that should have been there in the first place, OR there is a set of wooden double doors in the photo and the contrast doesn't show them. The pictures are a baffling ,either suggestion could be correct however the Fordson is in a bad state, according to the records of BODNEY Airfields Fire Platoon records they aquired 1 Fordson WO1 (busted steering needs replacing so out of service) 2 Crossley's (1 out of service Engine u/s) 2 portable trailer mounted pumps( both u/s) and these were issued for a Flying base by the RAF,so the picture with the Fordson with RAF roundles could be before picture to the one with the two trucks side by side, also note the tires are different treads. would also have thought the units abbreviation would be EAFFP, SO BEGS ANOTHER QUESTION? is this actually photographs of Deenthorpe or a Supply base ie AMMO , Fuel ?this would be correct for EFFP. Due to photobucket not always displaying them I guess I'd better upload the photo's again, now with the dates gleaned from the NARA captions that weren't available back in 2007, and a picture of the tender lost in the Deenethorpe Village crash. Chevron off-road tread on front tyres. RAF 10xxxx number on side of bonnet, top of wing mirror bracket level with top of bonnet, road-going tread on front tyres. RAF xxxxxx number on side of bonnet, top of wing mirror bracket level with bottom of windscreen, different road-going tread on front tyres. I wonder whether we're looking at three entirely different Fordsons here. 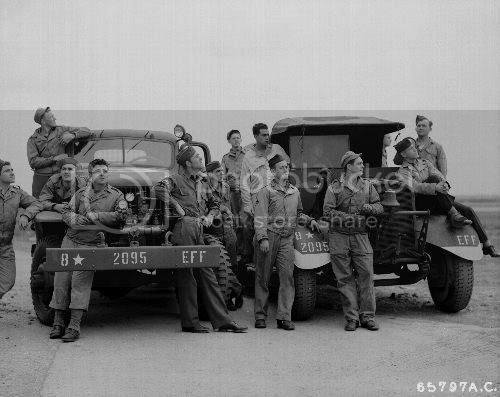 New information from the US Air Force Historical Research Agency seems to indicate the 2095th Engineer Fire Fighting Platoon was established around the 10th April 1944, presumably at Deenethorpe. This seems quite late, and I wonder whether 04-10-44 is a transcription error somewhere. The "8 ☆ 2095 EFF" marking is correct for the 2095th Engineer Fire Fighting Platoon at Deenethorpe, although some fire-fighting units within the 8AF marked their vehicles with the full "EFFP 2xxx" initials. Support units attached to the Army Air Forces had "Aviation" as a suffix, so in the case of the fire cover at AAF Station 141 Bodney would likely have been officially titled 2039th Engineer Fire Fighting Platoon (Aviation), although Engineer Aviation Fire Fighting Platoon may well have been used by some units informally. The US Army Corps of Engineers assumed the responsibility for fire fighting in the US Army on December 4th 1941, creating the first Army Engineer Fire Fighting Detachment (EFFD) on July 1st 1942. 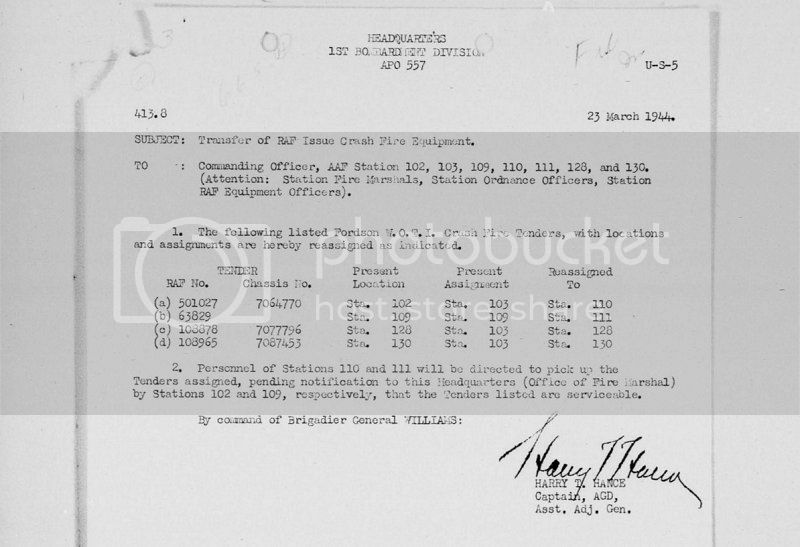 By the end of August 1943 these were retitled Engineer Fire Fighting Platoons under Table of Organization and Equipment 5-337 "Engineer Service Organization" issued in May 1943, which established the personnel as 1 officer and 28 enlisted men. The Table of Organization and Equipment 5-500 "Engineer Service Organization" of 31st July 1943 caused one T/4 Mechanic, Automobile to be replaced with an E-2 fire fighter. An amended TO&E 5-500 was issued 26 July 1944, with minor changes in personnel numbers and vehicle allotment. Re 2095th EFFP THE SUFFIX A has been missed, no problems with that ,excellent historical picture if not clear, shows that not only aircrew were at risk of being killed!, by the way i have All Army EFFP numbers for the entire UK, Deenthorpe 2095,Kimbolton2096,Molesworth 2097Polebrook 2098. (shows the local ones numbers folowed)do you have the list of the fire crew for Deenthorpe? how about KC?Have been researching history of US firemen in the Uk since 1941, found it very interesting.By the way we may find it starnge but there were All Afro -American Fire-fighting units operating in the UK. 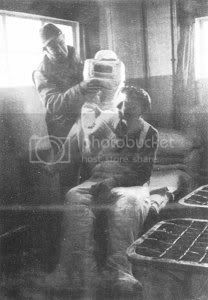 Sorry Phoenix, was not meant to upset anyone, just showing that there was segregation even in the Fire Section during WW2 but todays EFFPA operate mixed crews even WOMEN!! DID not mean to be political. 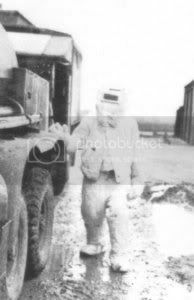 Contacted my ex WW2 EFFPA Firefighter,he is a hive of information. Possability activated at DALE MABRY AAC Base Florida January 1944,(possability was the date) arrived April 1944 RAF Deenthorpe,England. CLASS 135 4X4 (standard type found on Airfields)The PPE worn was Standard USA pattern Fire Jacket,Rubber thigh Boots with suspenders(his words but means braces) usualy the lining from the standard Military Helmet, this was the official PPE that should be worn but pictures show this is not the case, however in the ETO they were made to wear has above but ammo pouches, gas mask, Tin Helmet,Rifle/bayonet, standard First aid kit, basically with the exception of the fire jacket and the rubber boots standard GI Combat Uniform.He also says that when it was safe from Luftwaffe Air Attacks on Air Bases after D-Day the Fire Trucks were painted Red in many cases, but EFFP'S Operating in the ETO were still painted Olive Drab. 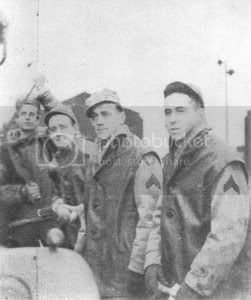 The 2095th Engineer Aviation Fire Fighting Platoon was activated at Deenthorpe, AAF#128, 10 April 1944. Prior to the units activation, firefighting duties at Deenthorpe was handled by firefighters of the 78th Station Complement using British Crash Tenders. Upon activation the 2095th recieved 12 firefighters from the 2023rd EAFFP at AFF#106. Also, nine firefighters from the 78th Station Complement were placed on Detached Service with the 2095th. The 2095th used British Crash tenders until American fire equipment arrived during June and July of 1944. This equipment included Class 1020 fire trailer and Class 135 Crash Truck. First documented fire call for the 2095th was on 11 May 44 when the unit responded to a fire at the 613th Bomb Squadron refueling dump near MP Post #3 where they extinguished a fire caused by gasoline being spilled on the ground. The 2095th served their entire tour of duty at Deenthorpe being inactivated on 15 April 1945. Did you get the copies of the photos from the 2095EFF at work thread I sent last September OK? If not, feel free to pull them from that thread. Yes I did, many thanks. On the posted photo, 65792AC, I believe this shows firefighters from the 78th Station Complement on the WOT 1 before the activation of the 2095th. How does one post pictures on this thread? 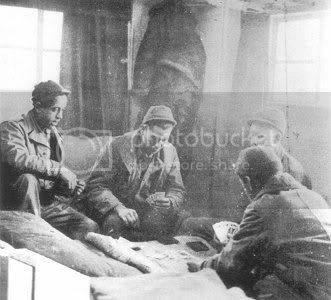 There were African-American Engineer Fire Fighting Platoons serving in the UK during the war, but no Engineer Aviation Fire Fighting Platoons. The Engineer Fire Fighting Platoons served at camps and depots. The Army Air Force was reluctant to accept black solders in great numbers within their ranks. Engineer Fire Fighting Platoons 1220th thru 1250th as well as others were all staffed by African-American firefighters under the command of a white officer. Somewhere I have a photo of what must be firefighters of the 78th Station Complement Squadron damping down after the Deenethorpe Village crash, alongside the local British firemen from Kettering and Corby. If I ever find it again I'll post it up. To put photos into a thread on this forum, you need to have them hosted online elsewhere, and just add [IMG] tags to the image's URL. Aim for a max image width of 600 pixels if you can. 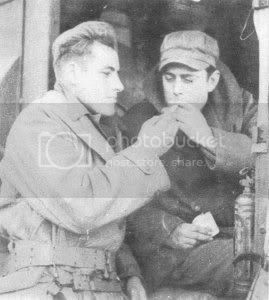 I've tried to clean up some of the photos of the crash crews from the Blue Book, from the vehicles in the images they will likely be 78th Station Complement Squadron personnel. These photos seem to have been taken at the same time as 65792AC upthread, 28th December 1943. Crash crew, NFE Store visible in background. This page was generated in 2.482 seconds.